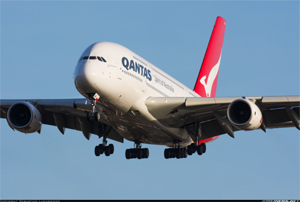 On November 04, 2010, Qantas Flight 32, an Airbus 380 operated by Qantas Airways Ltd, departed Changi Airport, Singapore on a scheduled passenger flight to Sydney, Australia. The flight carried 469 passengers and crew. About four minutes after take-off, while the aircraft was climbing through about 7,000 feet over Batam Island Indonesia, the flight crew heard two "bangs." The noises were the result of an uncontained failure of the No. 2 engine, a Rolls-Royce Trent 900 series turbofan. Debris from the engine impacted the aircraft, causing significant damage to the structure and airplane systems and resulted in fuel leakage from the left wing fuel tank. The airplane entered a holding pattern and, after 50 minutes of completing procedures and performing progressive aircraft controllability checks, the flight crew landed the aircraft safely at Changi Airport. Following landing, the No. 1 engine could not be shut down. With the No. 1 engine still running, and with flight crew concerns about leaking fuel and potential passenger injuries, passenger offloading was delayed for approximately an hour. Offloading was completed approximately one hour after offloading began (two hours after landing), using a single cabin exit. The No. 1 engine was successfully shut down three hours after landing by spraying firefighting agent into the engine inlet. The accident investigation determined that the probable cause of the engine failure was a manufacturing error involving an internal oil feed stub pipe. The oil feed pipe was manufactured with a reduced wall thicknesses that eventually cracked and caused oil spray leakage and fire in the High Pressure/Intermediate Pressure (HP/IP) bearing support hub assembly. The fire weakened the intermediate turbine drive arm, which subsequently fractured, allowing the IP turbine disk to overspeed and break apart. High speed engine debris penetrated many areas of the airplane, including damage to buildings beneath the flight path. There were no reported injuries to the passengers, crew, or persons on the ground.